I wonder if anyone uses their Apple TV to watch as many classic films as I do. After much deliberation, I finally purchased the Apple TV receiver from the sparkling new Apple Store in Grand Central two weeks ago. Initially a bit daunted by the tiny black box, its attendant cords and its installation, I was quite pleased to find the process a breeze. After five minutes of plugging things in and hiding the cords away and two minutes of linking my router and entering my Netflix information, I was streaming media like none other. A minute after that I blew my own mind when I figured out how to find my iTunes account on my laptop. It was like a real-life Minority Report! Ok, not really — but I was rather pleased with myself. I have been running through the classic films on the instant streaming service of Netflix ever since, which is only $8/month. My one complaint, if I must have one, is that specific artists can be difficult to find if you can’t guess (or don’t know) the name of one of their films that Netflix has available to stream. You can’t simply search by actor or director name. Now departing from my soapbox. Overall, I highly recommend Apple TV. It’s kind of amazing. I recently spent an evening revisiting one of my very favorite films — which also happens the inspiration source for the name of this blog, in fact. 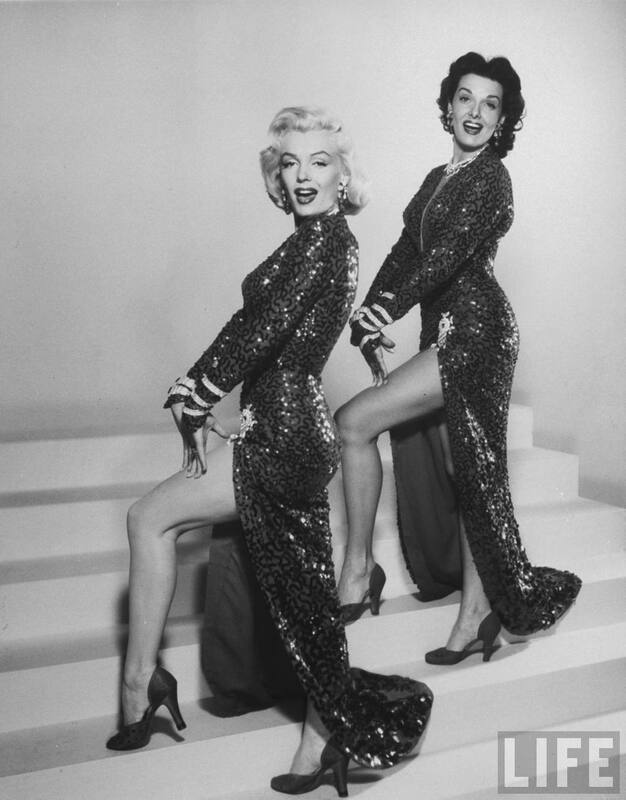 If you have never seen the Marilyn Monroe and Jane Russell film Gentlemen Prefer Blondes (1953), I will pause for a moment for you to drop absolutely everything you are doing and go watch it. No, really. I’ll wait. Most famous of course for the iconic musical number “Diamonds are a Girl’s Best Friend,” the film is a madcap romp detailing the adventures of two best friends as they search for suitable mates with suitably fat wallets. Both actresses are at their archetypal best: Monroe as the ditzy blonde, Russell as the wisecracking brunette. It’s kind of amazing how every time I watch Marilyn, I discover again how damned talented the woman was. When made the transition from actor to icon, it became so easy to reduce her to representative symbols: her blonde hair, the billowing white dress, her beauty mark, her voice. 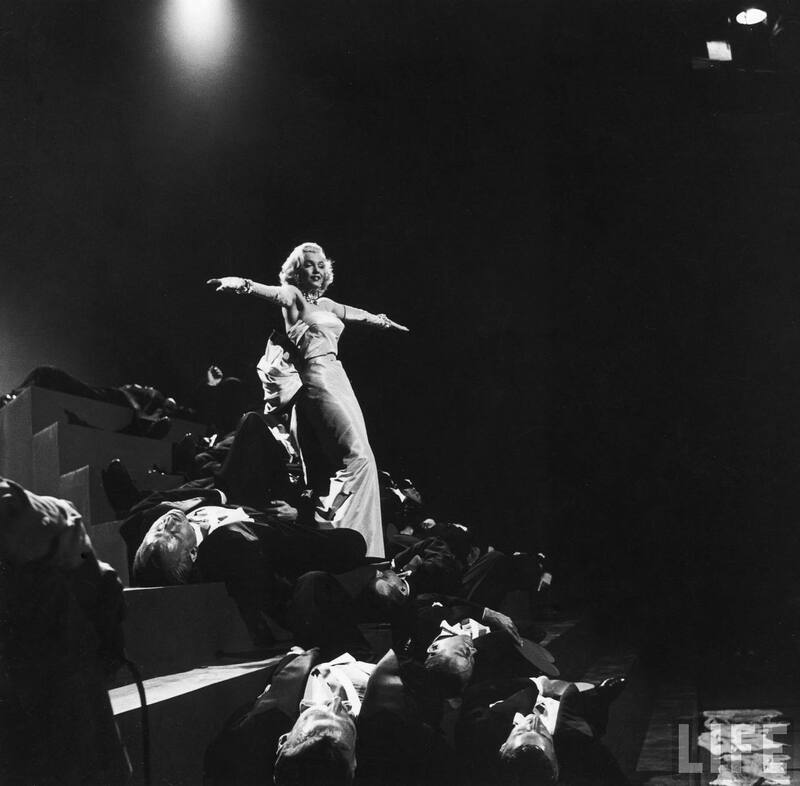 In Gentlemen Prefer Blondes you get to enjoy all that Marilyn has to offer: her spot-on comic timing, her lovely dancing and her singing (mostly, she got a little help on some songs). It really is no wonder Marilyn’s performance has inspired so many homages, and that none really come close to touching the original. Even if I do enjoy watching Nate, Dan and Chuck attempt choreography. Nicole Kidman in Moulin Rouge, 2001. Blake Lively for Gossip Girl, 2012. As I visit with old favorites and make new discoveries (Gregory Peck in Twelve O’Clock High was a revelation!) I can’t help but find it a bit humorous that I’ve taken what is the probably one of the most modern ways to consume media and have turned it into a time machine into the past. Humorous, but not surprising. In any event, if you like classic films as much as I do, the winning combination of Apple TV and Netflix instant will be your new Best Friend. But of course I still like diamonds. If you just can’t find the film you want–try IMDB or even Wikipedia. I just get a total blank sometimes and searching them usually gets a film name for me! Excellent idea Ruth, thank you! Maybe I’m totally misunderstanding what you’re saying about Netflix artist search, but doesn’t artist search exist? I have streaming only, and I use it all the time. For example, if I type William Powell into the search box then click on his name in the results, I see they have five of his movies available (including My Man Godfrey, yay, but not The Thin Man, boo). Ooh, it is completely possible I have missed how to search by artist in my rush, believe me. I know how to search for artists online, but through Apple TV I couldn’t figure it out. This will require further investigation. I haven’t seen either My Man Godfrey or The Thin Man — added to the list! Thanks very much for stopping by. You are currently reading A Girl’s New Best Friend at Quite Continental.